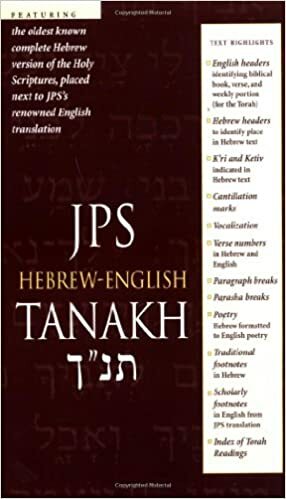 If you’re looking for a nicely formatted and carefully edited Hebrew-English Bible, I very much recommend the JPS Hebrew-English Tanakh (published in 2000). I like to have a Hebrew Bible that gives some “helps” for reading, and I’m finding this one to be a good fit for me. I tried the Reader’s Hebrew Bible, but I didn’t like the Hebrew font and I didn’t like how the Hebrew text was all crammed together with very few spaces or breaks. For me, it wasn’t laid out very well. The JPS Hebrew-English Bible, on the other hand, is laid out very nicely. The left column contains the second edition of the new JPS translation (English) and the right column contains the Hebrew text (based on the BHS – Biblia Hebraica Stuttgartensia). Both the English and the Hebrew fonts are very readable. The font size isn’t huge, but it is clear and larger than some other Hebrew Bibles I’ve seen. The poetry sections are displayed as poetry, there are regular paragraph breaks, there are footnotes for both the Hebrew and the English, and the actual appearance of each page looks very good (you can see previews on Amazon). The binding seems strong and the covers are solid. I like how the English and Hebrew are usually very closely linked. That is, if you read the Hebrew, your eyes don’t have to look long for the English translation because it’ll be right across the column in the same line or nearly the same line. I personally like the JPS translation; it’s a good one to have in the study. Another nice feature of this Hebrew-English Bible is that there’s an index of the books of the Hebrew Bible inside both the front and back covers. The Jewish order of the OT books in the Tanakh (Tora, Nevi’im, Kethuvim) differs from the English order, so it’s helpful to have an easily accessible Tanakh index with page numbers. The paper is relatively thin, so you can faintly see through the page to the words on another page. It’s not bad though, and neither my highlighters nor my pens have bled through so far. Anyway, if you’re in the market for a good Hebrew-English Bible, I’d very much recommend looking into this JPS Hebrew-English Tanakh. It’s not terribly expensive (under $40 right now) but it’s a very nice Bible. This entry was posted in Uncategorized and tagged BHS, bible, Hebrew, JPS, Tanakh.